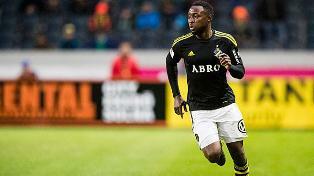 Nigeria international Chinedu Obasi took his tally to six goals from seven games when he found the back of the net in AIK’s 2-0 win over Alhaji Gero’s östersunds FK in the Swedish Allsvenskan on Sunday. AIK increased their lead when Obasi unleashed a low shot from just outside the penalty box, which took a wicked bounce before going past a surprised goalkeeper Hampus Nilsson. Having scored in four consecutive matches, against Djurgården, Elfsborg, Norrköping and östersunds FK , he has equaled the feat achieved by former Malmo hero Eddie Ofere who found the net in four straight games back in the 2009 season. If Chinedu Obasi adds to his tally in AIK’s next match against IFK Göteborg, he will become the first Nigerian player to score in five consecutive games in the league. The former Lyn Oslo and Hoffenheim star signed a short term contract with AIK in August 2016.